Gruffydd Maredudd Bowen Rhys (born 18 July 1970 in Haverfordwest) is a Welsh musician, performing solo and with several bands, including Super Furry Animals who obtained mainstream success in the 1990s. He also most recently formed the electro-pop outfit Neon Neon with Boom Bip. Their album Stainless Style was nominated for the 2008 Nationwide Mercury Prize. He won the 2011 Welsh Music Prize for his album Hotel Shampoo. He was educated at Ysgol Dyffryn Ogwen, Bethesda, Gwynedd, North Wales and was awarded a degree in art at Manchester Metropolitan University. 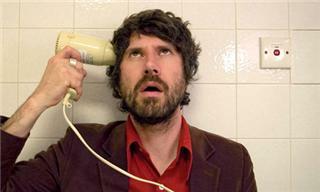 On 24 January 2005, Gruff Rhys released his first solo album, Yr Atal Genhedlaeth on the Placid Casual label. This was a loose, sketchy, all-Welsh-language album, with most of the instruments played by Rhys. A tour of Wales and several festival appearances followed. After SFA signed to Rough Trade, the new label agreed to take on his solo work as well and on 8 January 2007 they released Candylion, a batch of acoustic pop songs in English, Spanish and Welsh, which Rhys wrote whilst touring Love Kraft but which didn't fit with the direction of the new SFA album. A third solo album by Rhys, Hotel Shampoo was released on 14 February 2011. On the 4 March 2011, it was announced that Gruff will be playing at Glastonbury 2011.